Just recently scientists at CERN managed to manufacture some 50,000 antimatter atoms. The story was big enough to make most of the newspapers in the UK. What's interesting about it is that some of the newspapers that covered the story made some passing mention of Star Trek. Many aspects of the show have made it into popular culture - only a fraction of the population may actually watch Star Trek, but there are few people who could not tell you what a Klingon is, or where dilithium crystals are used. It's common to hear people use 'warp speed' as a synonym for anything very fast, and there can be few who would not recognise the phrase 'Beam me up, Scotty' - although like 'elementary, my dear Watson' and 'play it again, Sam' this phrase has never actually been used in any incarnation of the show. Judging from these newspaper reports, it would also seem that most people know that the Starship Enterprise is powered by antimatter - or more exactly, by a matter/antimatter reaction. In the early days of the original series, the ship's power source was not actually all that well defined. There were references to atomic power and fission in early episodes, although the dialogue stopped short of claiming this as the ship's primary power generation method. At some point the creators seem to have decided that atomic power was not powerful or futuristic enough for the Enterprise, and went looking for something better. A matter/antimatter reactor was decided upon, and mentioned for the first time in the episode 'The Naked Time'. It is true that matter and antimatter could indeed act as an immensely powerful fuel source in some futuristic reactor, and to this extent the writers had included a bit of 'hard' sci-fi in Star Trek. Unfortunately, they went on to give their antimatter some rather curious properties. Scotty : "Captain, you can't mix matter and antimatter cold. We'd go up in the biggest explosion since-"
Washburn : "We made a complete check check on structural and control damage, sir. As far as we can tell, something crashed through the deflectors and knocked out the generators. Somehow the antimatter in the warp drive pods has been deactivated." Kirk : "Deactivated? Scotty, could some kind of general energy dampening field do that? And would the same type of thing account for the heavy subspace interference?" Scotty : "Aye, it all adds up. But what sort of a thing could do all that?" Kirk : "Antimatter seems our only possibility." Spock : "An ounce should be sufficient. We can drain it from the ships engines, transport it to the planet's surface in a magnetic vacuum field." Kirk : "Contact medical stores. I want as much haemoplasm as they can spare in the transporter room in fifteen minutes." McCoy : "I presume you plan to use the haemoplasm to attract the creature?" Krik : "We must get it to the antimatter. It seems attracted to red blood cells, what better bait could we have?" Spock : "There is still one problem, captain." Kirk : "The blast, yes." Spock : "Exactly. A matter-antimatter blast will rip away half the planet's atmosphere. If our vessel is in orbit and encounters those shock waves..."
Kirk : "A chance we'll have to take, Mister Spock." Or about 73,725,000,000 Megatons. So our antimatter explosion would need to be about half of this, or 36,862,500,000 Megatons. Producing this amount of energy would require the annihilation of at least 1,761,222,222 kilos of matter/antimatter; it's more than 31 billion times as much energy as we would expect from the two ounces actually used. And even this assumes that every single bit of energy produced in the explosion would go towards pushing the atmosphere off the planet - no heat, no radiation, just kinetic energy. In reality the explosion would need to be considerably bigger even than this. We can rationalise that the planet in question was somewhat smaller and lighter than Earth, and had a thinner, less massive atmosphere which would be more easily dislodged. But this kind of thing is never going to come close to explaining a more than thirty billion-fold discrepancy between the amount of energy that should be released and the amount that the characters expect to be released. Kirk : "Kirk to Enterprise." Spock : "Spock here captain." Kirk : "Proceed immediately to maximum orbit." 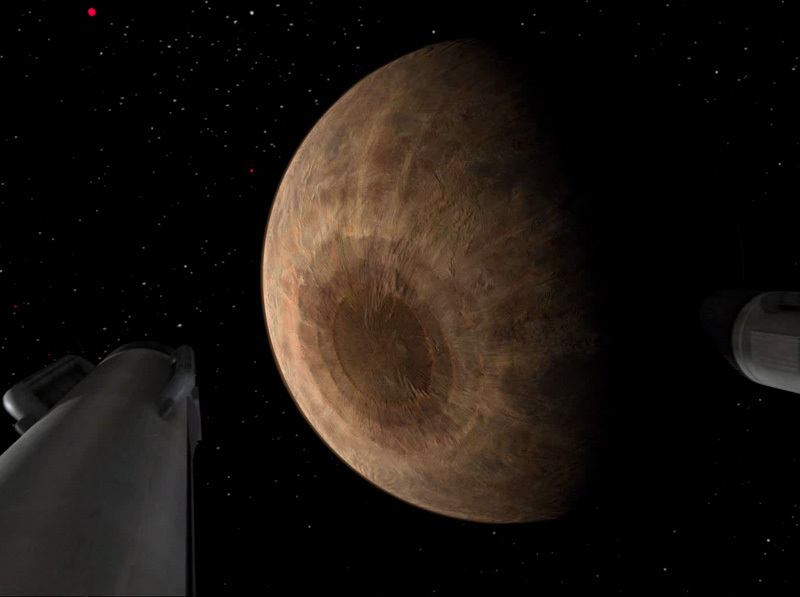 An exterior shot shows the ship moving away from the planet. Garrovick : "Just think captain - less than one ounce of antimatter here... it's more powerful than ten thousand cobalt bombs." Kirk : "Let's hope it's as powerful as man will ever get." The bomb is set off shortly afterwards (and amazingly, Garrovick survives despite being in a red uniform). The Enterprise is rocked by the explosion, even though it is in a 'maximum orbit'. In a theoretical sense there is no such thing as a 'maximum orbit'; a ship could orbit a planet at any distance. There would be practical difficulties once an orbit was large enough that the gravitational influence of other bodies became significant, but this would not happen until the ship was millions of miles distant. Presumably, then, 'maximum orbit' would be like the oft-used 'standard orbit' - a Starfleet term referring to an orbit that meets some pre-established criteria. We know that a Starship's orbit usually tends to decay quite rapidly if they lose engine power, indicating that they usually stay in the outer reaches of the atmosphere. In 'The Savage Curtain' the ship is orbiting a planet when Spock says that they are 'six hundred forty three miles, two thousand twenty one feet, two point zero four inches' above the surface. We know that transporters have a range of about 40,000 kilometres. This is deliberately just great enough that a ship can beam to and from the surface of an Earth-type planet whilst in a geosynchronous orbit, which is 35,000 kilometres in radius. Since Kirk was expecting the ship to beam him up before the explosion, this would be the outer limit of what a 'maximum orbit' could be. What is absolutely clear is that the antimatter charge did in fact rock the ship, when the ship would be an absolute minimum of hundreds of kilometres away and more likely tens of thousands of kilometres. Since there is no medium in space to carry a shockwave, then a significant fraction of the atmosphere of the planet must indeed have been thrown at least this high. As a matter of pure canon, then, one ounce of antimatter can indeed produce an explosion of the type Spock described. Note the absolutely gigantic crater on the surface. 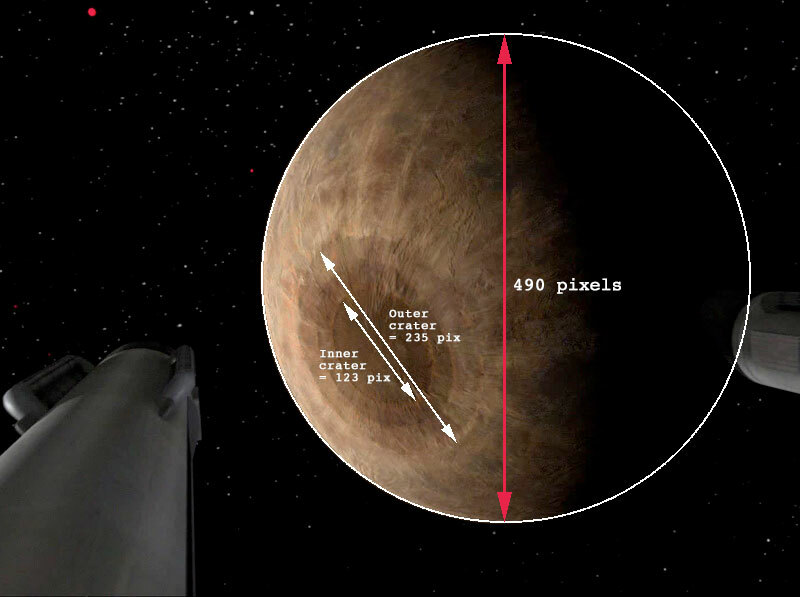 In this image the planet is some 490 pixels in diameter; it is hard to judge the size of the crater with any precision, but as shown the innermost ring of the crater is around 123 pixels in diameter, whilst the outermost extent of it is 235 pixels – with rays extending beyond that almost across the entire hemisphere. If the planet is Earth-sized, then the diameter is about 12,700 km and so each pixel equals about 26 kilometres. That would make the innermost part of the crater 3,190 km in diameter, and the outermost ring 6,090 km. Again, it’s worth noting that these are approximate figures because it’s not easy to judge the scale of something on a rounded surface like this. But it’s clear, this outer diameter of this crater is certainly in the region of 6,000 km in diameter. It’s certainly obvious that this detonation was far, far and away beyond a megaton or two. So both the spoken evidence, the evidence of the effect on the ship, and the visual evidence of what happened to the planet all agree that this is a serious, planet-wrecking event – all from one ounce of antimatter! Either Kirk changed his mind offscreen and decided to take a damn sight more of the stuff down there... or this antimatter is doing things our present day science says it should not be able to do. Spock : "Readings coming in now captain. Length approximately eleven thousand miles. Width varying from two thousand to three thousand miles. Outer layer studded with space debris and waste, interior consists of... protoplasm. Varying from a firmer gelatinous layer to a semi-fluid central mass. Condition... living." The space amoeba. Note the darker nucleus. Kirk : "This thing has a negative energy charge, everything seems to work in reverse. We'll use antimatter." Scotty : "Aye, it couldn't swallow that!" Kirk : "Mr Chekov prepare a probe. Scotty, we'll need a magnetic bottle for the charge. How soon?" Scotty : "It's on its way sir!" Kirk : "Mr Chekov, we'll use a timing detonator for the probe. We'll work out a setting. Helmsman, when do you estimate arrival on nucleus?" Helmsman : "Seven minutes sir." McCoy : "How close are you going to it?" Kirk : "Point blank range. We'll implant it and then back away." McCoy : "Why, the probe has a range of-"
Kirk : "With the eddies and currents in that thing, the probe could drift thousands of kilometres. We must be exactly on target, because we won't have a second chance." In the event, the ship manages to successfully lodge the antimatter within the nucleus, and then travels most of the way back to the cell membrane before the engine power fails. 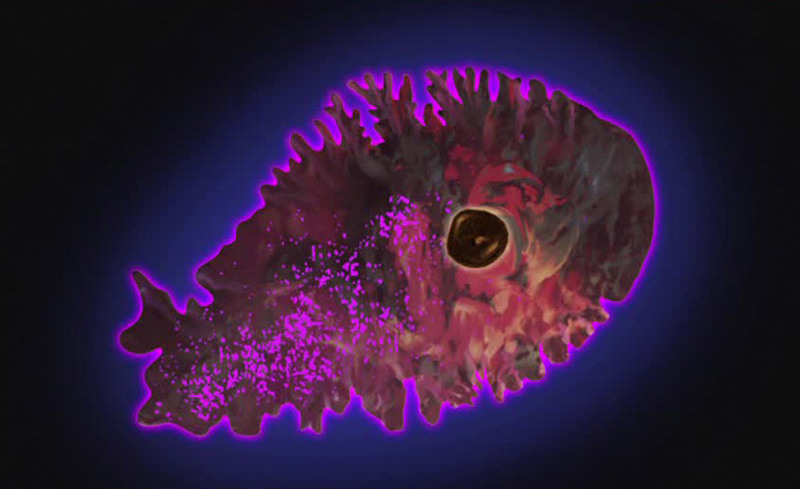 The explosion ruptures the amoeba's cell membrane and throws the Enterprise clear. Given the size of the creature, the ship would have to have been at least one thousand miles away from the nucleus to be close to the membrane when the explosion occurred. The ship masses 'nearly a million gross tons' according to Scotty in 'Mudd's Women', yet the blast threw it completely clear of both the creature and the zone of darkness within a matter of seconds - indeed we didn't even see any debris from the creature on the viewscreen. This implies a very large explosion indeed, easily comparable in size to that seen in 'Obsession'. Doing this with normal antimatter would, as calculated earlier, need a warhead massing something in the high hundreds of thousands of metric tons. I mentioned Scotty's line in 'Mudd's Women' giving the whole Enterprise a mass of nearly a million tons. Given this, it is highly unlikely that the ship could casually throw around three quarters of a million tons of antimatter. So while nobody specifies the mass of the warhead in this instance, we can see that it is highly unlikely to be in the form of normal antimatter. The first option is to say that our present day knowledge of antimatter is flawed. In the future, scientists will discover that antimatter can indeed act in the ways that Star Trek shows it to. This is, to put it mildly, highly unlikely. At the beginning of this article I mentioned the recent creation of 50,000 antimatter atoms by CERN. Scientists have been experimenting with subatomic particles of antimatter since the discovery of the positron (anti-electron) in 1932, and creating antimatter atoms for years now. To suggest that we could suddenly discover that all our knowledge of antimatter is wrong would be akin to suggesting that we could suddenly discover that Gold is a type of soft rubber. A little more credible is the idea that the scientists of the future have discovered some form of 'super-antimatter'. A material which shares enough of the properties of antimatter to share the name, but which is different in other ways. This could be analogous to the way in which liquid crystals are so named because they have some of the properties of a liquid and some of the properties of a crystal. This explanation has the advantage that it avoids most of the stepping on the toes of present day science whilst still allowing us to accept the canon as fact. 3) It's just a TV show, stupid! Option three is the old fall back - the writers made a mistake, let's ignore it and move on. While this has the virtue of being literally true, it's an attitude that I've always thought of as being somewhat lazy and lacking in imagination. Your mileage may vary. In accepting either option 1 or 2, we are accepting that the antimatter used in Star Trek is thirty billion times more powerful than that we know of today - each kilogram of M/AM mix would yield about 5.6x1027 J, equivalent to a 1,300,000,000,000 Megaton bomb. This has all kinds of implications for the power generation capacity of Starships and the yield of their weapons. For instance, 3 kg matter/antimatter charge described in the TNG technical manual would yield 3,900,000,000,000 Megatons instead of the 62 Megaton maximum possible with normal antimatter. The 2,000 kg M/AM charge carried by the Cardassian Dreadnought missile would have a yield of 2,600,000,000,000,000 Megatons. This begins to approach the kind of levels needed to blow a planet completely into fragments! Quite how super-antimatter manages to produce so much energy is a mystery. In Star Trek most such mysteries revolve around subspace, which acts as a kind of catchall explanation to make everything work just as the plot demands it should. So maybe the reaction between matter and super-antimatter releases energy from subspace. Or maybe the Wicked Witch of the West throws evil fairy dust on it. It doesn't really matter, the point is that this is the conclusion that the evidence forces us to.